Vacations are over and the new school year has begun. 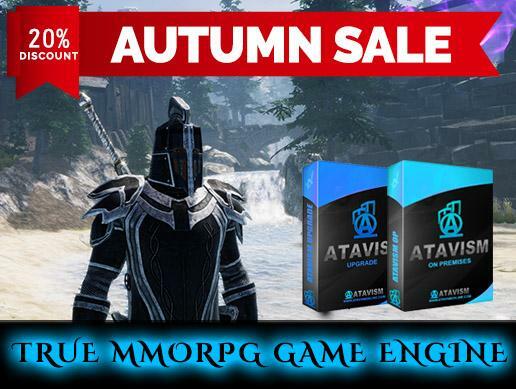 For this occasion, we prepared Autumn Sale for Atavism Licenses and Upgrades which you can get for 20% off. If you haven't seen what Atavism is capable to, grab the Atavism Live Demo sample for free and see for yourself: https://atavismonline.com/images/AtavismLiveDemo/AtavismDemo64.msi. Atavism 2018.2 is here. With its most demanding feature server-side NavMesh you can do so much, but pathfinding is only part of it. Based on NavMesh graph Atavism can now use full 3d aggro range, so you can fly above the mobs and not cause them to aggro. There is also Line of Sight feature, so if the hostile mob will find obstacle on the way to its target using NavMesh raycast then it won't aggro either. Atavism 2018.2 is close to release, and here is short Sneak Peek with NavMesh Pathfinding including 3D Aggro and Line of Sight features. You can also check S.F. Bay Dragon in action.